The Ministry for the Economy and Finance (French: Ministère de l'Économie et des Finances, [ministɛʁ dᵊ lekɔnɔmi e defiˈnɑ̃s]), called the Finance Ministry for short and informally referred to as Bercy, is one of the most important ministries in the Government of France. Its minister is one of the most prominent cabinet members after the Prime Minister. An other minister, who helps the Minister of the Economy, is a part of the Ministry, it is the Minister of the Public Account. it is not mandatory that there is a Minister of Public Accounts but this position has always been assured. The exact name of the ministry has changed over time, and has included the terms "economy", "industry", "finances", or "employment" through history. 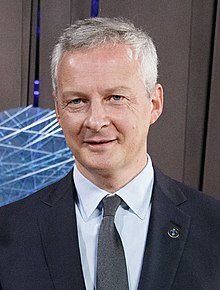 By her authority above the financial assets of the State, the financial and economic national system and the taxation rules, the Minister is allowed to represent France in the European Union council of the minister of the Economy and Finance (ECOFIN). the accounting of the State and all public bodies (by the Direction générale des Finances Publiques). the Direction générale des Finances Publiques for tax evaluation and collecting taxes such as VAT or corporate tax, income tax or local taxes based on Estate locative value. The taxation information system are being modernised by the so-called Copernic tax project. By delegation of the Prime Minister, he supervises also the Public Services (essentially statutes and salaries of the State, local and hospital Public Services) and the modernisation of the State (including computing means). He is responsible with their colleagues for Health, Youth and Sport and for Labour, Labour Relations and Solidarity of the equilibrium of social accounts. The Ministry of Finance is situated in Bercy, in the 12th arrondissement of Paris. The building extends to the Seine River, where there is an embarcadero with fast river boats for faster liaisons to other government agencies. That is why the French media often refer to it as simply "Bercy". The sentence the Bercy Fortress (la forteresse de Bercy) refers to the Ministry as a dark department with obtuse civil servants, especially of high rank. That is emphasized by the impressive look of the building. For evident practical reasons, the two ministers share the building and some common services that were under the former ministry of Economy, Finances and Industry. Wikimedia Commons has media related to Ministère des finances de Bercy. This page was last edited on 11 April 2019, at 14:02 (UTC).